Forgot iPhone Passcode? Try These Simple Methods! The iPhone’s passcode feature is an important way to keep prying out of your personal data, but what if you forget iPhone password or someone attempts to open with wrong passcode the iPhone gets disabled. You’ll need a way to regain access to you iPhone and your personal data stored on it. Apple doesn’t compromise when it comes to security. They have introduced two-factor verification system and strengthened their gadget’s defense against hacks and almost any possible vulnerability. If you have forgotten you iPhone passcode, don’t worry we got your back. 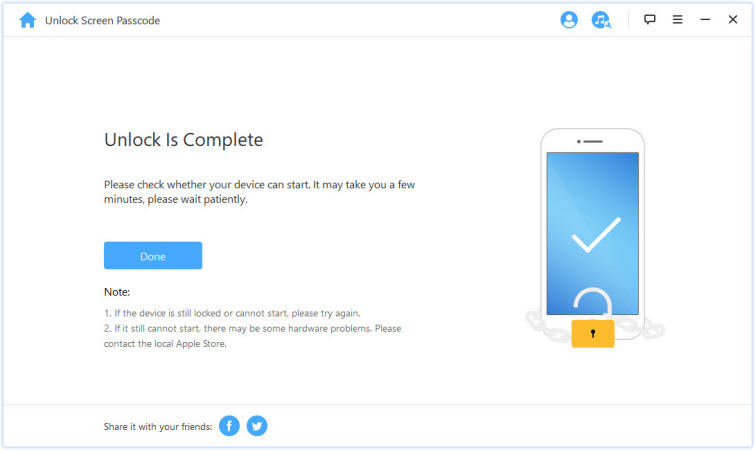 Just read our guide below and follow the steps correctly to regain access to your iPhone. iMyFone LockWiperis a third-party application specifically designed and coded to unlock iPhone screen passcode conveniently. It’s a user-friendly and effective. It’s easy to use program which has built-in application step-by-step tutorial to help you recover you iPhone and doesn’t require any technical skills or any previous knowledge of dealing with the iPhones. Easily removes screen lock of iPhone/iPad/iPod touch without passcode. Unlock any iOS device screen lock: 4-digit/6-digit passcodes, Touch ID & Face ID. No matter you have a locked, disabled or broken screen, it will remove the lock just in a few minutes. LockWiper enables you bypass iTunes easily. Open LockWiper, connect your device to your computer. Put your device into DFU mode by the instructions. As soon as your iPhone is in DFU mode, you’ll be asked to choose you iPhone Model and select the firmware to install from the drop-down list. After successfully doing that, hit the Unlock button and wait until LockWiper has completed unlocking your iPhone. iTunes is another choice to unlock your iPhone if you forgot iPhone passcode, follow these steps to unlock your iPhone. Connect your locked iPhone with the computer that has iTunes in it. Wait for a while after connecting until iTunes recognizes your iPhone and syncs it. If it doesn’t ask for passcode, press restore iPhone and wait until iTunes restores your iPhone. If you have enabled ‘Find my iPhone’ feature on your iPhone and forgot iPhone passcode, you can easily unlock it. Just follow the steps down below. Open your browser and go to www.icloud.com and login in with your iCloud account. Click Find My iPhone from the given menu. Click All devices at the top and select the iPhone you want to unlock (which you have forgotten the passcode for). Click Erase iPhone to remove passcode from you iPhone. You can now access your iPhone. Of all the options given above to regain access to a locked iPhone when you forgot iPhone passcode, only two of them seem to be feasible and user-friendly. Unlocking an iPhone using LockWiper is suggested to be the top priority before you take up things in your own hands and try it manually. If you’re sure that you have enabled your Find my iPhone feature on you iPhone, then it couldn’t get easier and feasible with iCloud. While the unlocking a forgotten passcode iPhone can be difficult when doing it with iTunes as it may requires passcode and the iTunes doesn’t have tutorial unlike LockWiper, which is why LockWiper is a safe bet to avoid any errors and unlock your iPhone quickly and easily.